I carve wooden spoons and spatulas from hardwoods. Each piece is individually shaped with traditional hand tools and hand-rubbed with a non-toxic oil finish. I use many different species of hardwood, and much of my wood comes from salvaged logs and limbs—wood that would otherwise end up in a burn-pile. My woodenware is made for regular kitchen use, and with a little care, each piece will last for many years. If you would like to purchase one of my spoons or spatulas, please contact me by e-mail at lastwordsmith AT gmail DOT com. Most of my spoons and spatulas are between $12 and $20 apiece. Wash your new spoon before using. Hand wash only—never put any wooden item in the dishwasher. Avoid letting wooden items soak in liquids for long periods of time. Cook the soup, not the spoon! The oil finish may dull over time, but the finish will last longer if you wash only in hot, clear water. You can let kitchen oils gradually replace the original finish, or you can restore it yourself by flooding the surface with a food-safe oil for a half hour, wiping off the excess, and letting the item dry overnight. (Food-safe oils include walnut oil, which can be found in some grocery stores with other vegetable oils, and butcher block oil, which is available with other wood finishes at most home centers.) Above all, enjoy cooking with your spoon. See my tutorial on spoon carving here, and my tutorial on spatula carving (with notes on finishes) here. Notes on making a wooden cutting board are here. Our display table at an outdoor craft market. 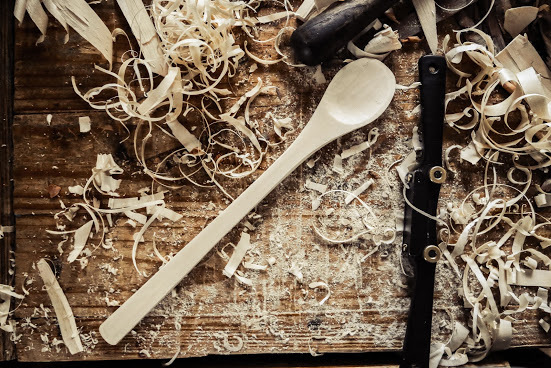 Despite being made to specific pattern, each utensil is shaped individually by hand, so each one is a little different in shape, size, and heft. Spoons and spatulas come in many shapes and colors. Sometimes, when the grain is bland, my daughter adds a woodburned design. Black walnut is one of my favorite woods to use. This set features a little bit of curly figure in the bowl of the larger spoon. I occasionally make small eating spoons, which are ideal for ice cream. (Unlike a metal spoon, the wood won’t freeze your tongue!) I usually make these out of pieces that aren’t quite big enough for regular spoons and spatulas. 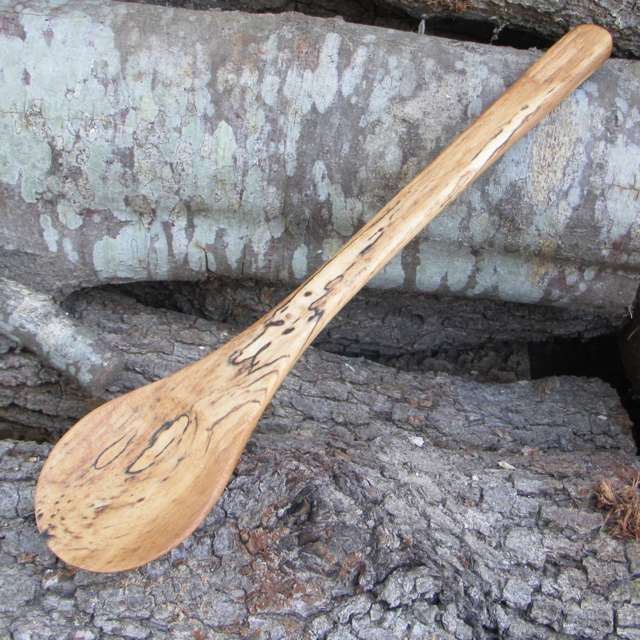 This large mixing spoon is made from spalted pecan. The spalting always creates a unique figure, and the pecan is very durable in everyday use. 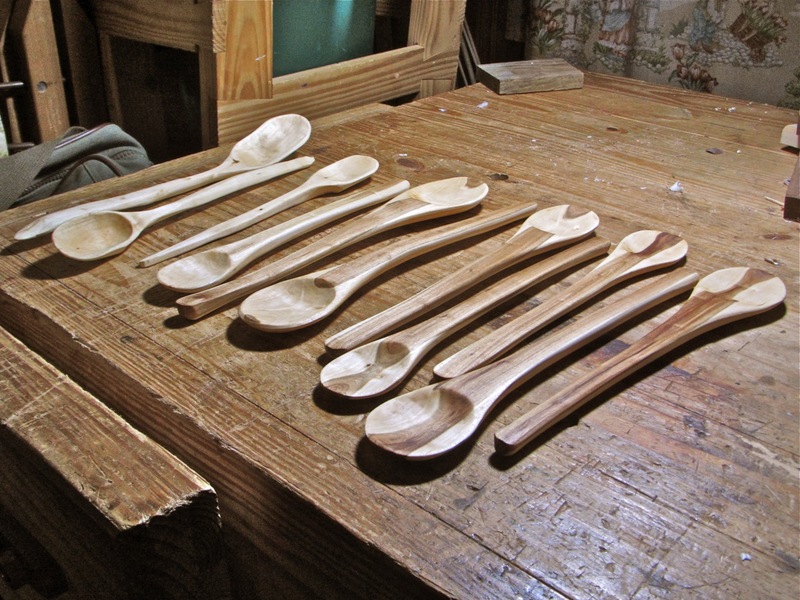 A set of spoons made from wood I salvaged from my neighborhood. The two-toned spoons are cherry. I have no idea what wood the other ones are. Wok spatulas are very popular items, and I make them in right-handed and left-handed versions. These are made from spalted water oak. A small spoon of soft maple, along with the shavings produced while making it. I made this pair of spoons from a tree limb I found in the back yard of my house soon after I moved in. To this day I do not know what kind of wood it is, but I was delighted to split the limb open and find curly figure. I gave both away to friends. A few years ago, I carved this miniature spoon out of cherry for my wife as a Christmas ornament. I made this spoon for one of my daughters, who likes to play in the kitchen while we cook. It’s made from pecan, so it would be difficult for her to break it. In the background is a serving spoon I made for myself. Could you please tell me where you buy the raw wood for your spoons? Thank you. I haven’t bought spoon wood for years. I’m a scavenger. I keep an eye out for promising logs and limbs, which I then split up into billets for carving. (Following a tree trimmer around for a day is usually productive.) I’ve salvaged wood from curbside rubbish, downed limbs, and firewood piles. I keep quite a few kinds of wood on hand. Ah. I hadn’t even thought about scavenging for wood sources, but it sure makes sense. 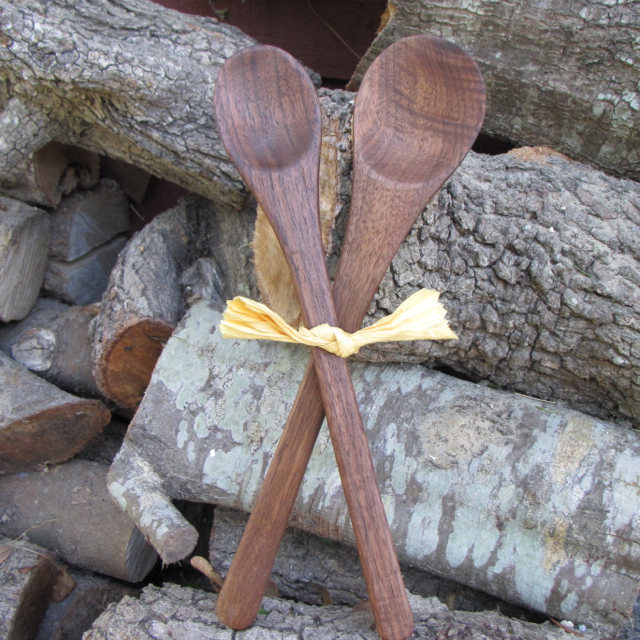 Your spoons have that lovely patina of “old” wood! Thank you for your reply.